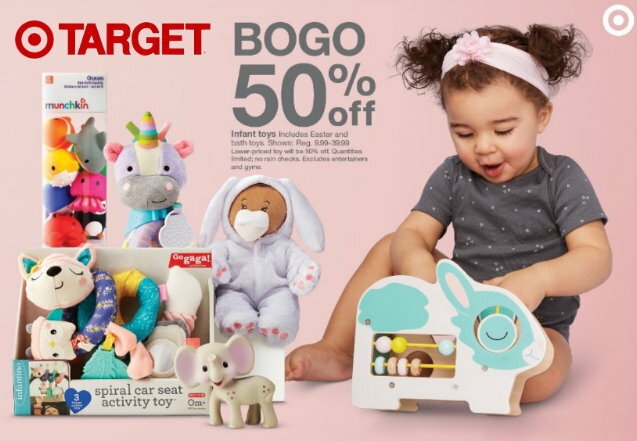 This week at Target thru Saturday, April 20th, Target is offering up a B1G1 50% Off Deal on Select Baby Toys both in stores and online at Target.com. No code or cartwheel is needed, just keep in mind the lower-priced item will be the one that is discounted 50% Off at the registers or at Checkout. Shipping is FREE on orders of $35 or more, or choose FREE store pickup where available. And as always, if you have a REDcard you will get FREE shipping with no minimum and an additional 5% Off. Just keep in mind though, that some of these items will only ship with orders of $25 or more.